Nicolas Fernandez presented the high honor student speech. Twenty-seven graduates of the Robert Haskins School of Leadership (RHSL) were recognized June 27 at Oklahoma City, Exchange Avenue. The commencement ceremony was well-attended by friends and family members of the graduates who received their diplomas in fields of Contextual Leadership Development (CLD). 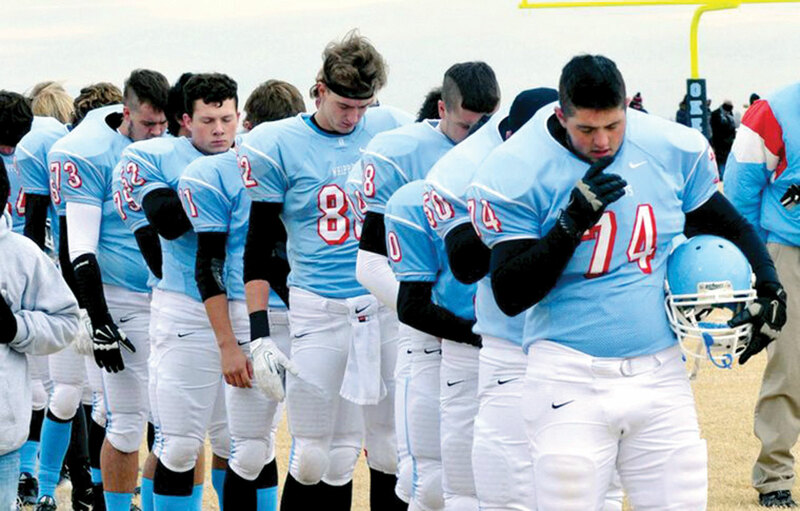 The graduating class featured 15 receiving diplomas in theology and 12 in Christian ministries, representing CLD centers in Duncan, Elk City, Guymon, Oklahoma City and Tulsa. 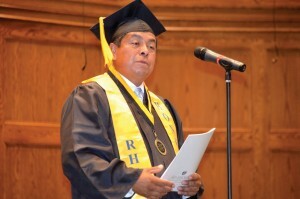 Members of the graduating class include Ernesto Alvarez, Jose Amaya, Marvin Barrios, Andres Briones, Salvador Canales, Juan Castaneda, Twila DeRouen, Nicolas Fernandez, Jesus Fuentes, Salvador Garcia, Rosalba Ledezma, Rolando Lopez, Jose Lozana, Juana Lozano, Debra Lucas, Jerry Lucas, Jamime Martinez, Irma Molina, Eddie Perez, Carlos Stanley, DaVaunah Thompson, Julio Torres, Gloria Varela, Rigoberto Varela, Crystal Viesca and Esther Villagrana. Emerson Falls, Native American ministries specialist for the Baptist General Convention of Oklahoma (BGCO), delivered the commencement address. Falls applied an illustration from the popular television show, “Mission Impossible,” explaining how agents were given a recording device that always featured with its message the phrase “Your mission, should you choose to accept it…” He compared these instructions to Jesus offering what is known as the Great Commission in Matt. 28. Robert Haskins, former BGCO senior associate executive director and RHSL namesake, hands Crystal Viesca her diploma. Anthony Jordan, BGCO executive director-treasurer, gave the charge to the graduating class. 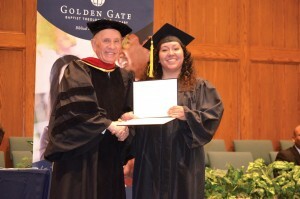 RHSL and BGCO sponsors Golden Gate Seminary extension classes that are included in the CLD program. RHSL continues to be committed to training and equipping students to be leaders within multicultural churches.